This project is an initiative of JTG-DT, hence the project has been existing in Gasegonyane and Joe Morolong communities, and because of the success it has had and also because there is a need for health services in Gamagara Local Municipality (GLM). GDF saw the need for the project to be extended to Gamagara, hence GDF is sponsoring the expansion of REA FOLA HEALTH PROMOTION in Gamagara Local Municipality, this is a means to bring the services closer and to benefit the community of Gamagara as it is the mandate of GDF to be the developmental organisation of choice to source, manage and disburse funds for the benefit of all beneficiary communities in the Gamagara Local Municipality, and to identify, select and implement developmental projects and initiatives to the benefit of all the beneficiaries equitably. 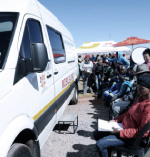 The initiative consists of three mobile clinics that provide medical services. The services include those of a general practitioner, a dentist and optometrist. Medical advice are also provided, where possible visual aids will be used by means of a projector to illustrate and emphasize the information. Each visit has a health promotion workshop where HIV/AIDS, TB, Diabetes, Hypertension, various cancers and healthy lifestyle are discussed and promoted with interactive sessions, and learning material are distributed. The services also includes ophthalmic screening, cervical screening, dental screening inclusive of decayed tooth extractions, cholesterol, glucose and hypertension screening health promotion workshops, awarding of spectacle in order of priority, and VCT (voluntary counselling and testing).